PresenTense Time Server for Windows PresenTense Time Server is an RFC standard multi protocol windows time server supporting the NTP4 and SNTP standards. You can use PresenTense Time Server to synchronize your PC to a primary time source such as an atomic clock on the internet or an inhouse GPS reciever and offer time services to clients on your local area network. Most leading GPS and Radio hardware clocks are supported via the serial port. Error notifications can be received via email or Syslog. PresenTense Time Server is an enterprise class windows time server that is easy to install, configure and maintain. PresenTense NTP Auditor monitors your computer's built-in clock and audits it's time in relation to real time. Many software packages claim to synchronize your computer to atomic clocks or satellite clocks on the internet but how do you really know that your computer's clock is correct? PresenTense Time Auditor allows you to monitor and record your computer's time and graph the difference between it and up to three national reference clocks on the internet. PresenTense NTP Auditor gives you the assurance that your synchronization software keeps the correct time, and the ability to prove it. Supports printing to a line printer and use of a local GPS clock as a reference time source. Low total cost of ownership ( professional support included, meaning no yearly fees ). 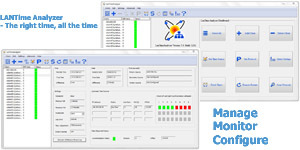 Simply put, a Windows time auditor that is versatile, inexpensive and works. PresenTense Time Client for Windows PresenTense Time Client is a Windows time client which runs on all modern versions of Windows. It synchronizes your PC system clock to a network time server. Supports e-mail notification with or without SMTP Auth, Syslog, redundancy and can be remotely managed by LanTime Analyser. PresenTense Time Client can be fully configured via DHCP. NTP4, SNTP TCP and UDP time are all supported so you can keep your computer clock accurate within microseconds! Low total cost of ownership ( professional support included, meaning no yearly fees ). Simply put, a Windows time client that is versatile, inexpensive and works. LanTime Analyzer - Manage, Monitor and Configure your PresenTense Time Clients. Combines the ability to manage all your network time clients centrally with the ability to visually maintain a status overview of you time servers and clients.